“How can I not lose it with my child?” is the question I get asked most often by the parents I work with in my practice. Learning to become aware of and tend to your triggers is the answer. When we lose it, we’re triggered and we react by engaging, what I call, our default pattern. Default patterns are when we act not from a place of conscious choosing but rather a habitual reaction to what is happening. You’re talking but have no conscious thought around the words that are flying out of your mouth. You’re not even sure if you’re stopping to breathe. You hear yourself saying things that had been said to you as a child. For one brief moment, there is a tiny quiet voice saying, “What are you doing? Stop.” But that voice is too small and too quiet, so your rant continues until it’s exhausted itself. And then you are filled with guilt and your inner critic begins its mean-spirited dance. I invite you to take a moment to connect with the last time you had a similar experience. It’s like you’re at the top of a well-worn snow sledding path on top of a very steep hill. This path has been used so many times that it’s even iced over. Your child does or says something to trigger you and “whoosh!” there you go speeding down that icy path just hanging on until you reach the bottom. You feel out-of-control. One gentle reminder… We all lose it with our children (and other people) sometimes. My intention is not to teach you some magical strategy that will allow you to never freak out again. Instead it’s to guide you to discovering and recognizing your personal triggers. I believe having an awareness of your triggers will allow you to start making new pathways and with practice you will create new default patterns and responses to your triggers. And maybe over time you will release some of your triggers. In this article, you are going to learn the four primary emotional triggers. You will discover greater self- awareness around your reactions to your child and within this awareness you will create an opening where change can occur. Our need for a sense of power and control in our lives is universal. It helps us to feel secure and safe. No one is more skilled at reminding us that we are truly not in control than our child. Often when we feel powerless, we cannot see our choices, we feel like a victim to life’s circumstances. We may try to gain power and control through demanding. The problem is that demanding always creates resistance. When our kids feel backed into a corner they either fight back or shut down. A gentler way of reacting when you’re feeling powerless is to take a step back and think of all your possible choices at the moment. They don’t have to be the best choices or even choices you would necessarily make. Creating awareness of your potential choices shifts your energy from a powerless, victim-like place to one of opportunity. This helps to re-set your sense of power and control. Ever had this thought before? Or said it out loud? As a parent, you are naturally attuned to your child’s needs and prioritize meeting their needs often above meeting your own needs. Your child’s ego-centrism can be very frustrating. While it may seem personal and rude, it’s more likely indicative of their developmental stage and not a character defect. Is feeling devalued, unimportant, and unappreciated one of your primary triggers? Do you try to make it the other person’s responsibility to fix? If they would just show more gratitude, you wouldn’t get so upset. Is this a sign that you need to set better boundaries? Or would you benefit from more self-care – a moment to appreciate yourself, to value yourself and to acknowledge the things you do for everyone? Let’s take a moment, here, now, to practice some self-care. Pause what you’re doing and put your hand on your heart. Ok, take a deep breath and let how that feels sink in. At its essence fear is our body’s way of warning us that something bad is either going to happen or is likely to happen if we continue down this path of action. When we talk about emotional fears, our thoughts often transport us through time to the future. If my daughter can’t keep up with her 5th grade homework, how is she ever going to survive college? If my son only has a couple of friends, is he going to be an unhappy and lonely adult? 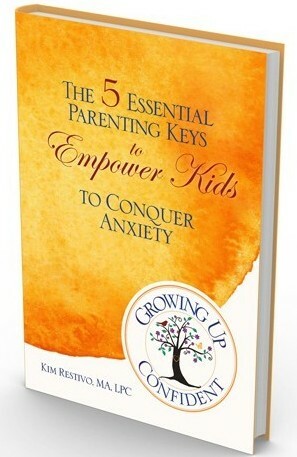 Fear of today’s behavior predicting future behavior and future success or failure can trigger most parents since they want to ensure that they are doing everything they can to guide their children to be happy, healthy, successful adults. Shame and Embarrassment go hand-in-hand with fear. Fear of experiencing shame and embarrassment can be a huge motivator for people. Do you parent differently when you are in front of other people? Are your parenting choices influenced by your concerns around being judged by friends or family? Do you find that you compare yourself to other parents and you usually come out lacking in some way? Do you struggle with feeling like you are not doing a good job as a mother or father? When you respond to your child from a place of being triggered by shame, you are often taking on their behavior as if it was your own or, at the least, as if it’s a reflection on how good of a parent you are. Not personalizing your child’s actions and reactions can be very helpful when you are triggered by shame. You can quiet the story that is creating the shame. One way to do that is to be curious. Being curious allows you to look at the situation in an interested and inquiring way. It helps you to avoid judgment and to avoid personalizing the situation. When your feelings of powerlessness, being devalued, fear and shame get triggered and you act them out, remember how you treat yourself when you lose it is so important. Be gentle with yourself. I’m going to invite you to reflect for a moment and take a little self- inventory. Decide which one of the 4 emotional triggers: powerlessness, being devalued, fear or shame hijacks you the most often. I’d love to hear in the comments below which one you choose and how you feel it impacts your parenting. Am a mother of 2 boys one who is 3 and my other is 7, my 7 year old suffers from Anxiety everyday and night, But on the other hand so do I. You see his not my blood his my step son but his mother choses to be not involved, She pops in when mother hood is good for her, the sad part is she has another child age 1.
any how I leave this comment because your blogs seem to be helping my child we have started the little things are to ” Name it to tame it” and it work I turned it into a game. As for me losing it, you see I tend to STROM in when I have had enough raising my voice but within a few minutes I see the look on his face, the fear I quickly calm myself down and think, I see so much of my mother doing this she would storm in or speed\anger walk to my brother all the time and be in his face yelling at me.. I HATE IT and you see i don’t know why i do it, I know i feel overwhelmed and fear, I never feel like i have done enough I always feel like am letting my children down. I started reading this blog and I have found myself STOP. THINK. BRIGHT …. and now I don’t STORM in anymore.. Your love for your children and desire to break the habits you grew up with shine through in your post. Not storming in when you’re triggered is a huge change to make. One that will grow your connection with your boys. Yay, you!!! I’m so glad you’re finding the tools and ideas I share here helpful. I’m working on a new blog series. Let me know if you have any questions you’d like me to answer.